♥ Take a look at the amazing Marlene Dietrich inspired suit that Debi made and shared on her blog, My Happy Sewing Place. ♥ Kate listed these adorable Flapper Doodle sweater clips in her shop that I'm in love with. ♥ Kate also shared her top 5 cheer up movies - go take a look at her list and share yours with her, too, if you feel so inclined. I did! And noticed 3 out of my 5 starred Tim Curry. ♥ Miss Rayne shared a knitting pattern for a super cute sailor sweater. ♥ Quincy announced the launch of her own handmade clothing line - I'll have one of each, please! ♥ Mary Deluxe shared the recipe for some home made ritz style crackers that sound quite tasty. ♥ Darshana posted a beautiful art deco inspired poster she designed for Chelsea Piers in NYC. ♥ Thanks to Cee I found this post on Retro Renovation on one of the most amazing living spaces I have ever seen. 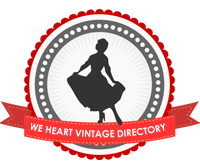 If you're into mid-century furniture, collectibles, etc., you have to see this post. Dakota - you're welcome! I know what you mean & I'm glad someone is getting something out of this :D Oh, and it's such a great flickr stream. 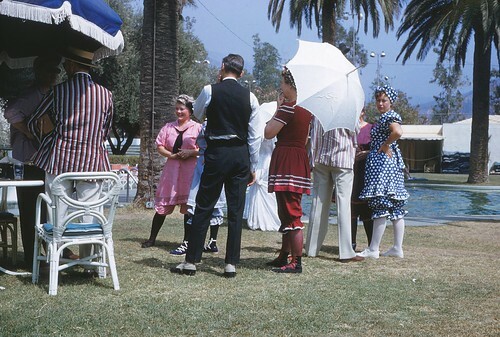 That image of the 1955 costume party is too marvelous for words! I've long adored that Flickr stream, but hadn't yet seen that particular photo. Stellar find, Andi, thanks so much for sharing!!! That 'Top 5 Cheer-Up Movies' link was a godsend. So glad I found your blog!